In 1908, Rodin was introduced by the music hall actress Loie Fuller to the Japanese dancer Ohta Hisa [1868-1945] famously known as Hanako. Hanako was the only oriental subject he sculpted. And according to Albert Elsen, the foremost Rodin scholar of his day, Rodin made more sculptures of Hanako than of any other sitter. For him, she represented a symbol of oriental beauty and mystery. A quality that must both have captivated and, at first, eluded him, given the number of sculptures he made of her. Indeed as turned, this sculpture reveals more than one expression. It is interesting to compare the surface of this sculpture with that of Rodin's life-size' Iris' in the Tate Gallery. The squares left by the plaster mould remain on each. And 'both noses' are rubbed. The surface casting and definition appear finer on the Hanako. 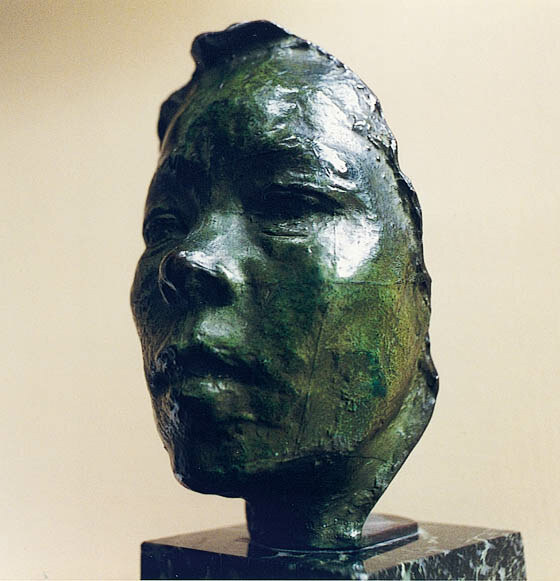 And this, together with the fact that the 'Tate Iris' was cast by the same foundry 'Alexis Rudier' before 1913, make it likely the Hanako was also cast in Rodin's lifetime. Henri Naus, from whom it was acquired by the previous owner in the 1930's. Albert Elsen, Rodin, London, 1974, Page 119 [another cast illustrated]. John Tancock, The Sculpture of Auguste Rodin, Philadelphia, 1976. Page 546 [another cast illustrated, Page 551].